With the new X470 motherboard refresh to complement the release of the Ryzen 2000-series of processors, motherboard vendors have had the opportunity to improve upon their previous X370 models. ASRock has released a new flagship AM4 socketed board without all of the gaming marketing and hype, with the focus this time around being realigned towards the enthusiast. The X470 Taichi Ultimate sits at the top of ASRock's AM4 motherboard stack as it aims to improve upon their existing X370 Taichi with features such as 10-gigabit networking. 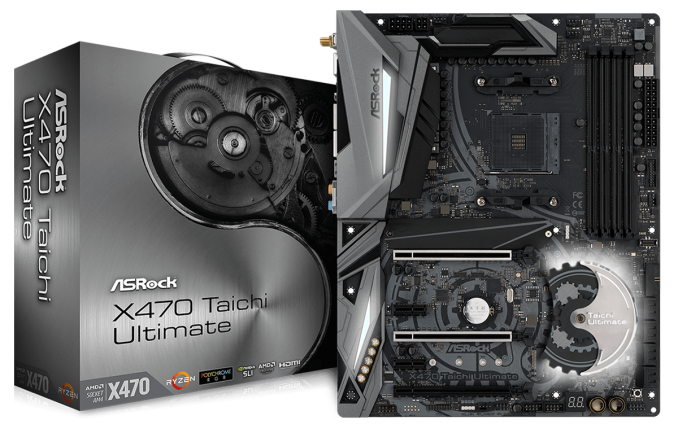 The Taichi Ultimate is the flagship AM4 ATX motherboard from ASRock which has a clear focus on performance. A few indications of this include the addition of an Aquantia AQC107 10Gb/s 10GBase-T network port, as well a large and overkill sixteen phase power delivery controlled by the formidable International Rectifier Infineon IR35201 PWM controller. Also featured is a Realtek ALC1220 audio codec with the audio section of the PCB sporting an array of Nichicon Gold audio capacitors behind a plastic covering to enhance the already bold aesthetics. With a price tag of $300, a lot is expected from ASRock. This price puts the X470 Taichi Ultimate as one the most expensive AM4 motherboards currently released. What ASRock has done with the Taichi Ultimate is give the PCB a unique styling which resembles mechanical cogs; even the chipset heatsink has this styling. Among this is a wave of Polychrome RGB lighting areas which ASRock regard as a big feature in their arsenal with the certification giving compatibility with various other RGB enabled devices on the market such as cooling products and even chassis. While sitting atop of the ASRock X470 pile, the Taichi Ultimate does include a single HDMI 1.4b output for users hoping to use one of the new Ryzen 2000 series APUs, (although pairing a $99 APU up with a board costing three times more is a luxury most users won’t be able to justify). ASRock has omitted any USB 2.0 ports on the rear panel, choosing instead to host six USB 3.0 Type-A ports and two USB 3.1 (1 x Type-A and 1 x Type-C) ports. Aside from USB real estate, the remaining bulk of the rear panel consists of a set of six 3.5mm audio jacks from the onboard Realtek ALC 1220 codec, an Intel I211-AT Gigabit Ethernet, an Aquantia AQC107 10GbE LAN port, and an Intel-based 802.11ac Wi-Fi module. The jump from X370 to X470 brings one major highlight in terms of improvement and that’s memory compatibility. 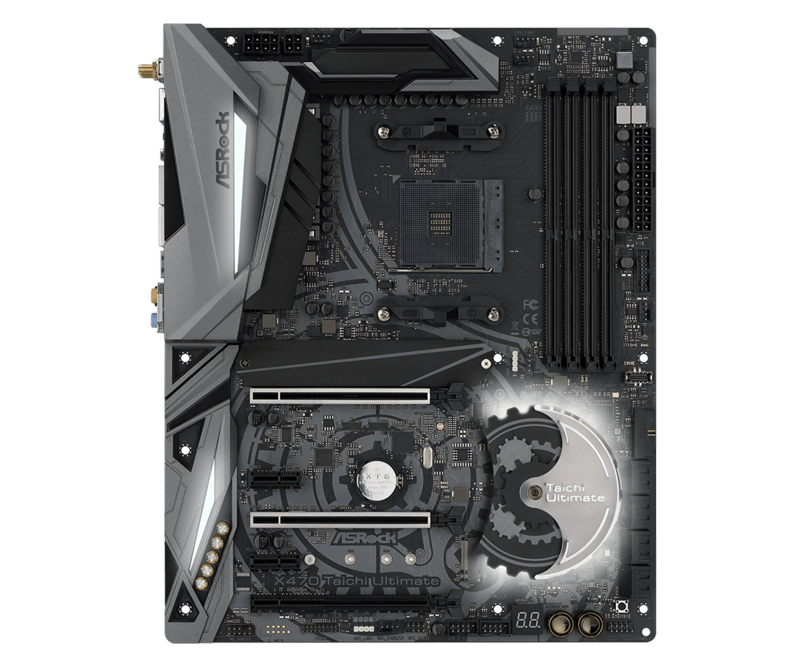 The ASRock X470 Taichi Ultimate has a total of four DRAM slots with support for up to DDR4-3466+ while having a capability to accommodate a maximum of 64GB in total. The X470 Taichi Ultimate could easily be appealing to a user looking to build a unique themed Ryzen based workstation as the board features a total eight SATA 6Gbps, with six being powered from the X470 chipset directly and the other two being governed by an ASMedia ASM1061 SATA controller. A total of two M.2 slots are present with the primary slot (top slot with heat sink) being PCIe 3.0 x4 and the secondary slot (bottom) sharing bandwidth with the full-length PCIe 2.0 x4 slot consequentially disabling the slot if an M.2 drive is populated. From a performance perspective, the ASRock X470 Taichi Ultimate steams through our test suite pretty comfortably and does very well throughout; the strongest showing in our system suite was in POSTing time. The gaming performance was a little bit sub-par compared to X370 by a couple of percent, but in line with other X470 tests. The power consumption does put this as one of the more power hungry AM4 socketed boards on test, although the audio testing and video conversion data does paint a better picture with the X470 Taichi Ultimate achieving the best average frame rate within Handbrake at HQ settings to date from any AM4 board we've tested. Unlike other ASRock B350/X370/X470 models on test, DPC latency figures proved somewhat worse on the Taichi Ultimate with the results being somewhat modest in comparison to the boards pedigree. While not DPC latency optimized, ASRock has usually been a consistent performer, alas the Taichi Ultimate doesn't fall in line in this regard. For overclocking, our Ryzen 7 1700 chip did hit the 4.0 GHz we have seen on other AM4 motherboards, however the sweet spot was at 3.9 GHz based on voltage increases. 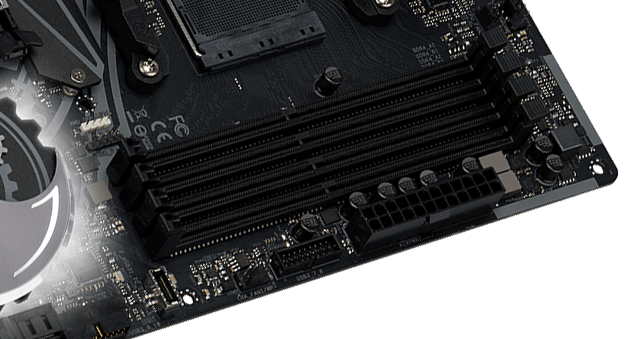 All-in-all, the ASRock X470 Taichi Ultimate motherboard does include a very select premium component choice with the 10G LAN port, an overkill 16-phase power delivery and a large amount of rear panel connectors to satisfy most users. High-end enthusiasts will appreciate these premium features along with an onboard OC style section in the bottom right corner consisting of a reset switch, power button and second clear CMOS button, including a LED POST indicator which can be very handy in troubleshooting potential booting problems. The consensus is ASRock has gone as all-out as they can with a board listed at $300 but also retained supplementary controllers such as the premium Realtek ALC 1220 audio codec and an Intel I211-AT Gigabit LAN port to compliment the sought after Aquantia 10G LAN port; all consequential of having a $300 price tag.
" The consensus is ASRock has gone as all-out as they can with a board listed at $300 "